When it comes to losing weight, simplicity equals success. The color-coded Portion-Control Containers and Shakeology® shaker cup deliver exactly the right portions every time, so you never eat too much or too little. Simply fill them as directed in the Eating Plan based on your calorie target. Combine this Eating Plan with one 30-minute workout a day. That’s all. It’s that simple. It’s not a “diet.” In fact, it’s exactly the opposite. 21 Day Fix encourages you to eat — in the right portions, so you don’t feel miserable and deprived — so you can finally start losing weight. 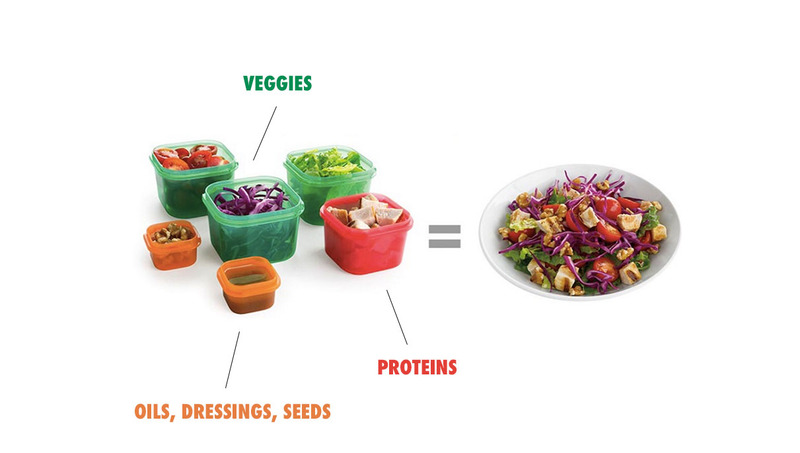 The Portion-Control Containers are key. Each one is color-coded for a different kind of food and pre-measured for correct portions. There are tons of Fix-friendly recipes on the Beachbody Blog, in Autumn’s cooking show, FIXATE, on Beachbody on Demand, and in Autumn’s FIXATE cookbooks. Spoiler alert: There’s a recipe for macaroni and cheese. Like we said, 21 Day Fix wants you to eat! Meal planning is key for weight loss. Committing to clean, portion-controlled food every day will help you stay on track so you can get the best results. 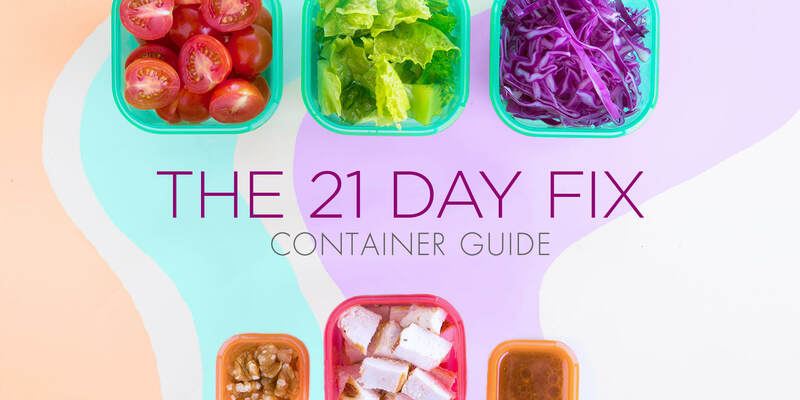 The 21 Day Fix Tool Kit includes a Meal Planner to help you visually map out your meals for the day, but we recommend using any system that helps you stick to the program. First comes planning, then comes prepping. We’re all about meal prepping here at Beachbody. Taking the time to prepare nutritious, homemade meals for the week sets you up for success. Having the right food at the ready will help you stop junk-food cravings, hungry episodes and all those setbacks we’ve had from time to time. Like Autumn says – fail to prepare, prepare to fail. Take the guesswork (and self-control) out of portion control by measuring out your veggies, fruits, protein, carbs, and fats in these containers. Then, review your 21 Day Fix Container Plan, which is determined by calculating your daily calorie target. Your specific Container Plan will tell you how many of each container you can have per day. For example, if there’s a “3” by the green container (veggies) then you will fill the green container with veggies three times a day. Next, look at the Container Food Groups. Fill your containers with your favorite healthy foods from the Food Group lists in the Eating Plan guidebook. Then, track your daily container portions on the Tally Sheets provided in the Eating Plan guidebook or on the Beachbody Nutrition App. 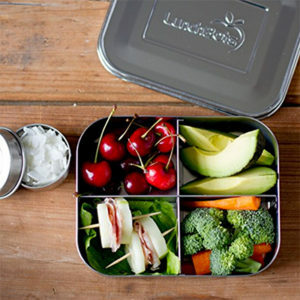 Green Container: Veggies like broccoli, spinach and even pico de gallo. Purple Container: Fruits like blueberries, strawberries, mango, and banana. Red Container: Proteins like chicken breast, salmon, eggs, and tempeh. Yellow Container: Carbohydrates like sweet potato, brown rice, tortillas, whole-wheat bread, and wine (yes, wine!). Blue Container: Healthy fats like avocado, cheddar cheese, and cashews. Orange Container: Seeds and dressings like pine nuts, cashews, cheddar, and mozzarella. Teaspoons: Oils and butters like peanut butter, olive oil, and mayonnaise. Fun Fact: FIXATE began as a cookbook authored by Autumn herself. You can buy the book here. 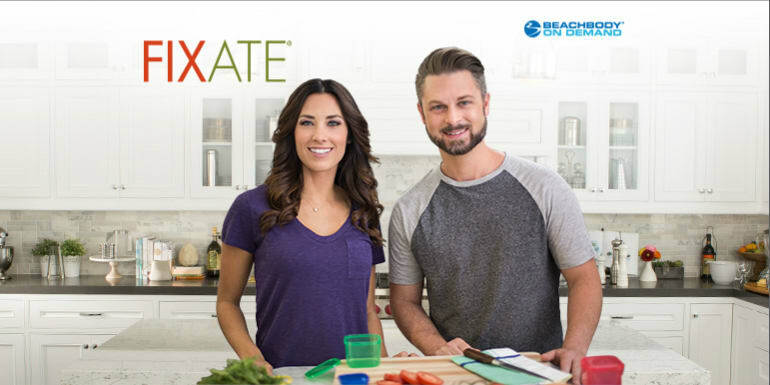 FIXATE is Beachbody on Demand’s cooking show hosted by Autumn and her brother, Chef Bobby Calabrese. Learn how to cook Fix-friendly recipes for healthy weight loss that your whole family will love. 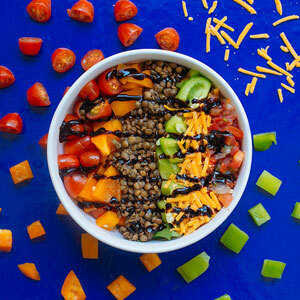 From Vegan Kale Nachos and Herb-Crusted Beef Tenderloin to a Caramel Apple Martini and Healthy Red Velvet Cupcakes, FIXATE has recipes that will please any palate!